Spray rises up from the surface of the water of Okjeongho lake, making a beautiful landscape. The lake is located in the upstream of Seomjingang river, which is famous for clean water. It makes wonderful landscape in spring and fall when wet fog is often created due to a huge daily temperature range. 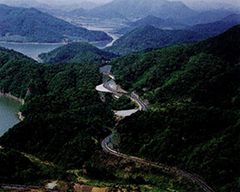 excellence award among “100 beautiful roads in Korea”. Seomjin river and mountains make a beautiful watercolor painting. You can feel cozy atmosphere of the upstream of Seomjin river. 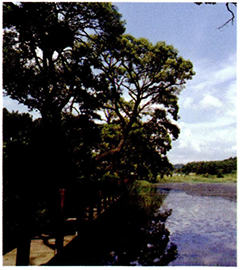 You can also enjoy the pure nature moods while walking along 9 kilometers trail. Saseondae has a legend about four Taoists and four Taoist fairies two thousand years ago. It has various things to see like clean water of Ocheonwon, Saseollu, Seongmi mountain fortress, sculpture park and fountains. 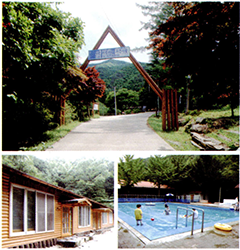 It is a four season tourist site equipped with youth training center and artificial grass fields. 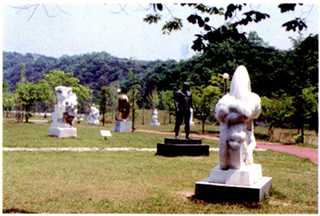 It exhibits sculptures made by sculptors around the world in Ogung-ri art von, matching up with beautiful nature of Saseondae. 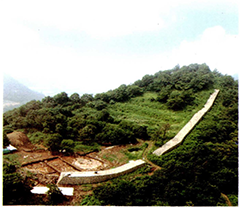 The fortress surrounds around mountaintop of Seongmisan mountain with an altitude of 430.5 meters in Gwanchon-myeon. The circumference is 517.5 meters. 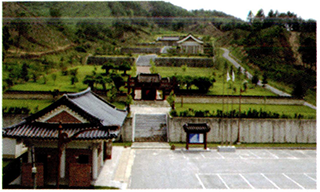 It was a defense facility in six and seven century when Silla and Baekje pitted against each other. 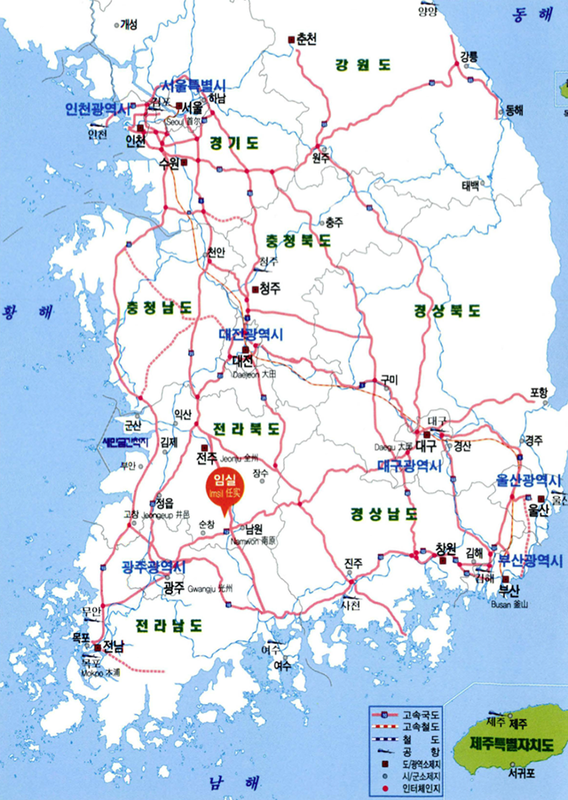 It has important material value in geopolitics in that it is located in national highway from Jeonju and Namwon, and Seomjin riverside. 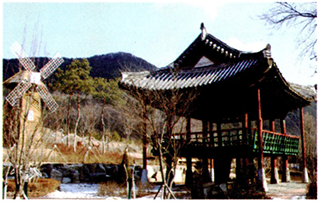 It seems that most fortresses were built in the Baekjae Period. 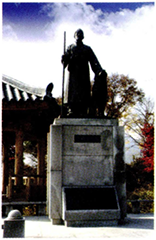 Uigyeonbi monument, which is located in Wondongsan park, Osu-ri, Osu-myeon, was built in the period of united Silla or before the Goryeo dynasty. It is in dog shape which rescued its owner and died. It looks like ascending to heaven. The monument stands for Osu, the region of faithful dog. 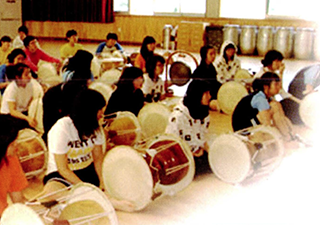 OsuUigyeon(the faithful dog of Osu) cultural enterprise has been promoted since last 1995 in order to empathize intimacy between human and animal, and shed new light on Osu as a town of filial piety. 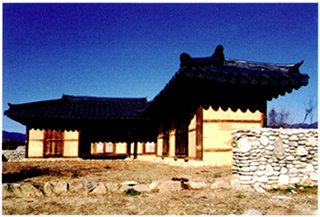 Birthplace of Gimgaein was restored in Yeongcheon-ri, Jisa-myeon, Imsil-gun. 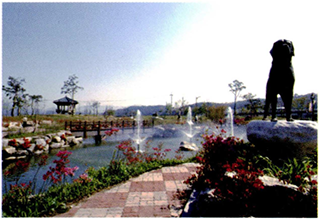 Uigyeon park was established in Osu-myeon to admire soul of the faithful dog thousand years ago. Uigyeon cultural festival is hold in the park. Moreover, it is a popular tourist attraction for pet dog as Uigyeon sight is under construction. Prickly waterlily grows naturally in Daejeongseong Reservoir of about 3000 pyeong. It is only one annual water plant around the world. Its leaves from rhizome float on the water, which have lined front side with thorn. Purple flowers blossom around October, presenting a grand sight. 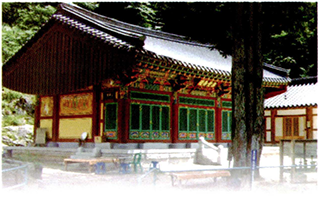 It was established by two Buddhist monks, Haegyeong and Wolsan, in 1352. So it is called as Haeworam, quoted initial of their names. The temple has four front rooms, three side rooms and a hipped roof. Buddhist shrine is located in the right side, and a signboard named “Bulgwangbozo” is hung under the eaves of the temple. The shrine was built to admire general Iseogyong and 28 martyrs under his command in the late period of Joseon. It succeeds patriotic spirit of patriotic martyrs who fought against Japan, and died for national independence. Sochungsa shrine zen festival is hold on October every year. 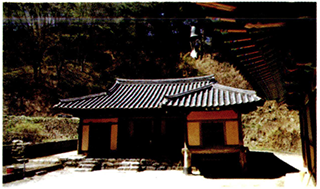 It is called Doseonam, built by Dosan Buddhist monk in 875. The stories about him and Taejo Wang Geon have been passed down. Some people say Yi Seong-gye, the first king of the Joseon Dynasty, achieved spiritual enlightenment in this place. Sangiam stupa has been handed down as a historical cultural asset. 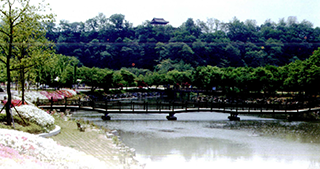 Wolpajeong pavilion, built in Seomjingang riverside, is a classical architecture. Its elaborate carvings, elegant lines and splendid dancheong go together with surroundings. Oddly formed rocks and strangely shaped stones in the edge of the river are in harmony with tall and exuberant pine trees, making a piece of landscape painting. Bakssagol has produced the most many doctors in the country(153 people). You can learn the culture of classical scholars and doctors in the center. It has beautiful landscape with clean air and clean water. You can also experience culture of farm village and traditional culture. The center is equipped with physical training facilities and accommodations. Imsil cheese theme park has various facilities such as experience center of cheese and pizza, promotion hall, milk processing factory and agricultural specialty product market. 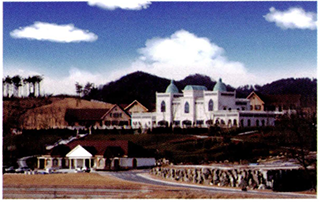 In particular, you can see the past, present and future of Imsil cheese in the cheese castle. Not only that, you can experience fairy tale world through cheese experience program run in the broad field. Imsil cheese village is small, but full of dreams. It is happy cheese village where local people work together, and make the place that “people is more beautiful than flowers”. You can see a small, but united world by participating in cheese dairy and farm experience run by locals. 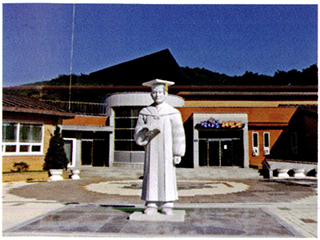 Imsil cheese school draws people's attention with various culture experience to make a cheese village in Korea. Why don't you make a story with Imsil cheese school by feeling the nature? It develops children's ability to observe by making their personality and sensitivity harmonized. It is “the place to enjoy and learn” for children, and “the place to return to the innocence of childhood, and deepen the relationship among family” for families. Busy modern people can enjoy leisurely life-style, and make precious memories. Children can play in the nature, and feel happiness. 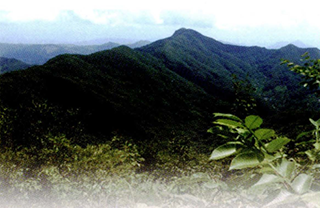 Why don't you get out of the busy downtown area, relieve stress and feel pleasure in the nature?. 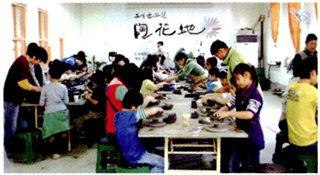 You can learn pottery culture in the nature where pottery flowers blossom. It is the cheapest shooting range in the country. Beginners can also enjoy clay pigeon shooting since they are given one-on-one tutoring. Seongsusan mountain is often called as Imsil Seongsusan or Jinan Seongsusan. 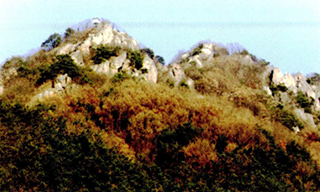 The ridge of Unjangsan mountain, the highest peak of northern Geumnamjeongmaek, stretches to the south, creating Maisan mountain, Deoktaesan mountain and Seongaksan mountain. Finally it makes famous Seongsusan mountain in Seongsu, Imsil. If you climb the top, you can see numerous mountain peaks in the vast green field. 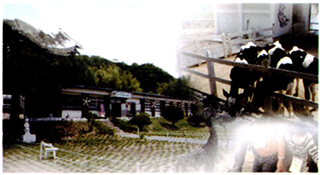 In 6.6km valley from forestry research and training institute to Sangiam, there are a lot of tourist attractions like Jowolji, Geobukttam, Yeongchunji, Cheongunji and Guryongdam. In particular, you would admire Hwanhuidam where Yi Seong-gye, the first king of the Joseon Dynasty, took a bath and received a divine revelation from the Buddhist Goddess after praying one hundred days. If you arrive at Cheongung-myeon, after driving along Sunchang national highway from Imsil-eup, you can see Baengnyeonsan mountain in the north. It separates Cheongung-myeon and Gangjin-myeon. You can see beautiful landscape in the site of Baengnyeonsa temple, after following along southern valley from Cheongung-myeon. You can overlook Moaksan mountain, Mandeoksan mountain and Hwamunsan mountain in the meteorological observatory on the top. 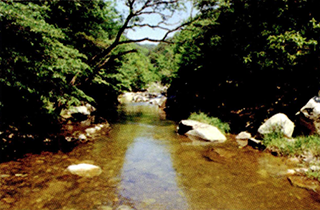 The stream of Okjeongho lake and Seomjingang river wraps around the central mountain. It is called as “ Baengnyeonsan mountain” since it looks like a lotus in the middle of the pond. Cheongung-myeon→ Singimangneu→ Sanggangjin village, and Mountaintop→ Yiyoon village→ Yongdong village, Banghyeon-ri are the famous hiking courses. There are a lot of extraordinary rocks such as Namguen rock, Sanbuingwa rock, Madang rock, Jeonmang rock, Tongcheonmun gate and Chotdaebawi rock. The mountain consists of eight rock hills, which makes wonderful landscape. The view of mountain is out of sight. In particular, you can experience thrilling climbing since you have to go up steep stairs made with wood and steel and climb the rock face. It takes about three hours to climb. If you go from the top to Sambongsan mountain, which is about seven kilometers, it would take about five hours. Apricot blossoms attract springtime picnickers in spring, and people gather in Seomjingang river in summer. You can walk along Seomjingang river while enjoying tasteful river with autumn leaves in fall. Even if human beings use any techniques, they cannot catch up with the beauty of the nature. As the landscape of Seomjingang river is made by the nature, not human beings, it is more beautiful and awesome. 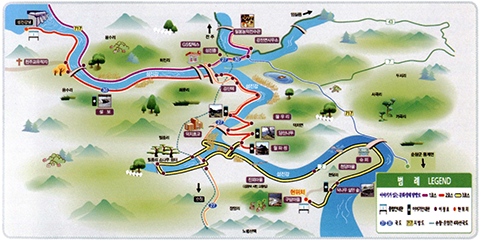 In particular, the road from Jinmoe village, Cheondam village to Gudam village is the best of the rambling journey along Seomjingang river. 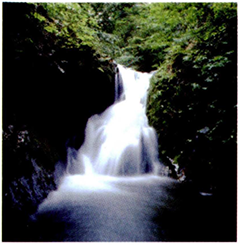 Seongsusan natural recreation forest is located in the foot of Seongsusan mountain (an altitude of 876m), the boundary between Insil and Jinan. It has various facilities, large accommodations and dense woodland. It is located between 603m Wontongsan mountain and 571m Jichobong. It has educational facilities like outside classroom and natural observation center, and various facilities like campfire spot, forest house, equipment for physical training, children´s playground, pool, pavilion, trail, square and woodland walk path.